Albeit not a new release, just figured we could use a thread for this title. 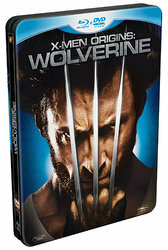 Looks good, its blu-ray sized but its region locked. 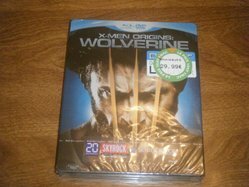 I prefer it to the German edition since it doesnt have the FSK logo on it. This is awesome, I was never a fan of the German one due to its printed on green fsk logo. With Iron Man fetching so much and their being two releases. German and Canadian. You'd think this one would go up in value since their is only 2 ... German and French. I wonder if German is locked since this one is locked .... none the less, I believe this one would be worth more due to FSK. I concur, its nice. I own it. Ok, got my copy ... Looks awesome! Maybe the next IronMan haha? When Wolvy 2 comes out. 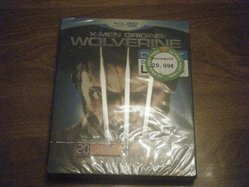 Just like IronMan they only released 2 Wolvy titles this one and German one. I'm not a fan of the German one ... I like this one better, esp since I didnt know his claws are all like pure metal on both front and back! Here's some pics. In the first pic you can see how the claws are shiny metal on the back. Same as the front, which the 3rd pic basically highlights with the darker shot. 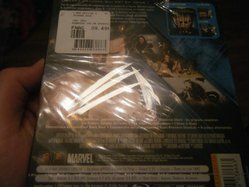 Funny how the stock photo is so huge that many orginally thought it would be DVD size, clearly not the case. Awesome steel, imo. Looks good! I'm hunting one! I hope chip doesn't mind me saying Karl, but I think I found his auction - he paid $70 for a sealed copy, but it had a dent on it. Looks like shipping was $12. LOL. That was it. The dent is on the back. Hoping the front looks good!!! I like the bare metal claws on this. Can't believe I actually manage to find this one on Fnac.com Marketplace for 15€ shipped to Canada and arrived within 7 days in PERFECT condition!!! BTW, I know you guys won't believe me, but, true story! Thanks for a friend to pointing it out! That's an awesome deal. Insane. Great score. He must have paid half that in shipping alone lol.